This page is written by the game's inventor, Francois Tremblay. Chesscala is a hybrid of the two most popular abstract strategy games in the world, Chess and Mancala. The objective of Chesscala is to checkmate one or both of your opponent's Kings. In this regard, it is a Chess-like game. Captures are made as in Chess. Movement is as in Mancala, with fixed paths and a sowing mechanism, making it a Mancala-like game. Chesscala is a very offensive-oriented game. Pawn chains are very difficult to create, and defending pieces is often dubious. Defense is usually either created by generating serious threats to the opponent, or by sowing against the opponent's attack. Seizing and keeping the momentum is of prime importance. Chesscala offers you a lot of options (for instance, there are 33 possible opening moves, and a 4-piece stack can be sowed in up to 24 different ways), but, as in Chess, careful selection of the options which keep momentum going for one's side while closing off potential threats is what makes the difference between victory and defeat. Depending on skill level and opening setup, a game of Chesscala can take anywhere between one and two hours. Setting up a game of Chesscala requires three regular White and Black armies (two Kings on each side, from 12 to 15 Pawns, and generally four of each other piece, more if you make the new pieces from existing ones as I recommend), as well as some checkers (generally no more than one or two will be needed at a time, and they may safely be replaced by whatever else you may have on hand). We have also found it very helpful, for the first few games, to put little pieces of paper below each file with an arrow pointing in the direction of movement. Chesscala is not an entirely simple game, but I hope you will try it and be rewarded by its depth and the different kinds of strategic thinking that it requires. Skill in Chess or Mancala is not required to play Chesscala well; although of course knowing Chess and Mancala is an advantage, the rules below explain everything in, I hope, sufficient clarity and simplicity to make it accessible to everyone who knows how Chess pieces move. If you have any further questions or comments, please post them on this page or send me an email at francoistremblay28 at gmail.com and I will answer them to the best of my ability. Some beginner tips (we've had to learn these the hard way) : Forget about piece values from Chess, they are of little use in this game. Treat every piece as potentially sacrificable to gain or keep tempo; unless you are about to lose from attrition, positioning is far more important than material in this game. In fact, it seems that winning at Chesscala more or less requires you to hold the initiative for a long time. Do not attack in earnest unless you are reasonably certain that it will result in checkmate. Be kind to each other; let the other player take back the moves he just played so they can try something else. This game can get hopelessly complex sometimes, and even after playing Chesscala for months we still do this once in a while. Position the bigger pieces towards yourself and the smaller pieces towards your opponent, so they can see what's on your squares more easily. A game of Chesscala is not a trivial endeavour, so shake hands after the game for a job well done. We hope these tips will help you along the way to mastering Chesscala (or at least get better than us) and make it more fun. All labels are for White. Mancala: A circuit upon which pieces travel (traditionally, these pieces are undifferentiated rocks or seeds; in Chesscala, they are chess pieces). In Chesscala, the a and b files, c and d files, and e and f files form three separate mancalas, and each mancala has an attacking line and a retreating line (their position being relative to the player). Attack mancalas: The mancalas on which the opponent has a King (always the left and center mancalas relative to the player). As their name indicates, the attack mancalas are the mancalas where attacks are most likely to originate. Support mancala: The mancala on which the opponent does not have a King (always the right mancala relative to the player). Strategically, as its name says, the support mancala mainly helps support attacks from the other two mancalas. Attacking line: The file in a mancala upon which one advances (always the right side relative to the player). Retreating line: The file in a mancala upon which one retreats (always the left side relative to the player). King's field: The only two squares that a King may occupy. The King's fields for White are: c1 and d1 for the middle mancala King, e1 and f1 for the right mancala King. Stack: All the pieces present on a given square. Up to four pieces can be in a stack; a stack with four pieces is considered full. White and black pieces can co-exist in the same stack. Sowing: Laying down the pieces in a stack, one per square, in the direction of movement (attacking line: up, retreating line: down). If an extremity of the mancala is reached, then sowing continues counter-clockwise (from b8 to a8, from a1 to b1). The choice of which piece is laid down in what order is left to the player, and provides much of the complexity of Chesscala. Attack: A series of sowings on an attacking line, usually with the intent to checkmate (said sowings need not be consecutive, although they are grouped in time). Stack control: If one player has more pieces in a stack than his opponent, then he has control of that stack. If both have the same number of pieces in the stack, they both control it. Stack control determines who can sow it. Square control: If a square has a stack, then whoever controls the stack also controls the square; in addition, an empty square is considered to be under both players' control. Turn: A turn in Chesscala is composed of two moves: (1) a capturing move (optional), then (2) a sowing move (mandatory). There are two exceptions: the Bomb may capture on the second move if it has been sowed on the first move, and a side under multiple checks may capture or sow on either move. Capturing move: Any move which results in the capture of a piece. Sowing move: Any move which consists solely of sowing a stack or moving one of one's Kings. Checkmate: As in Chess, this is achieved by threatening the King and making it impossible for the King to be freed from threats. 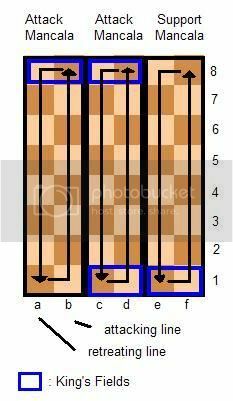 The main difference in Chesscala is that each side has two Kings and two possible moves every turn, making possible things like dual checks (a check on each King), dual double checks, forked checks, forked dual double checks, etc. Attrition: After losing a certain amount of material, it becomes extremely difficult to mount attacks. This usually happens when beginners waste their pieces in ineffective attacks and counter-attacks. This is why Chesscala games are stopped when one of the players loses 12 pieces. All setups are mirrored for Black, with the attacking lines on a file, c file and e file, Kings on a8 and c8, Queens on b8, d8 and f8, etc. If you're looking for some variety, try these other ones we've tested. This setup is easier for beginners to learn with, as it does not use any new pieces. The armies, however, also lack the versatility given by the new pieces. The Rook, which is generally fairly useless in Chesscala, becomes the star piece (and if used properly can even mount a reasonably strong defense). Development in general is arduous until the Rooks facing one's attacking lines are dealt with, although the endgame doesn't change. This is definitely the strongest opening position. Chesscala introduces two new pieces, one which exploits stack formations- the Bomb- and one which possesses great long-range capture powers but no short-range ones- the Hammer. (1) It can capture any opposing piece on its own stack. (2) If sowed on the first move, it can then capture any opposing piece on its own stack, which constitutes the player's second move. It is the only piece in the game which can capture on the second move. The Bomb can only capture within its own stack. (1) White can use the Bomb to capture the Black Bishop as their capturing move. (2) White can sow the stack in the following order: Pawn, Black Bishop, Bomb. As their second move, they can then capture either the Black Knight or the Black Rook. The Hammer (H), represented by a King with the top of its cross cut off ( ), has Advancer-type capturing powers of the Queen and the Knight. Furthermore, it may perform a double Knight move, as long as (a) both Knight moves are exactly the same (e.g. two squares to the left, one square upwards), (b) the intervening square is controlled by the player and (c) the intervening square and the square it is to land on do not have a full stack (whether single or double, the final, capturing Knight jump is one in each direction instead of one and two). In the following diagram, black circles are on squares the Hammer can slide to, blue circles are on squares the Hammer can leap to, and green circles are on squares the Hammer ends up after a capture. The Hammer cannot capture the Black Bishop because the intervening square is controlled by Black, and cannot capture the Black Knight because Advancer capture necessitates at least one square between the advancer piece and its target. These are the first three rows for White (a pretty bad position to be in, with a check and a dual forked check, but it's not checkmate). The Hammer is on e1. * It cannot capture the Bishop on e2 because of his Advancer move (the Queen can do so however). * It can capture either the Bishop or the Knight on c3, ending its move on d2. * It can capture the Queen on f3, ending its move on f2. * Finally, it can capture the Rook or the Pawn on a3, with the first jump landing on c2 and the second jump ending on b3. Pawns promote to Man ( ). The Man captures as a King but is non-royal. For the sake of representation in this game, place a checkers piece under the promoted Pawn. The black circles in the diagram below illustrate the Man's capture powers. All other pieces capture as they do in Orthodox Chess (with the exception that there is no en passant). The order of play is as in Chess: White's turn, then Black's turn, then White's turn, then Black's turn, and so on. On his first turn, in order to even out the odds, White may only sow from b, d, e or f file. A turn is composed of two moves: (1) a capturing move (optional), then (2) a sowing move (mandatory). No captures can be made on the second move, with the exception of the Bomb's sowing-capture action. Sowing move: Sowing is the means by which pieces move around their mancalas. Select a stack under your control to sow (you may never sow a stack that is under opponent control), then place one piece per square in the direction of movement. The order of sowing is the player's decision. If a square already has a full stack, the sowing must skip over it. Starting with a Knight, a Bishop and a Pawn on the bottom square to be sowed, one of the following six sowing orders can be played. As the diagram in the glossary illustrates, pieces are sown counter-clockwise within the mancalas, as you would expect by following the direction of movement. The King cannot be sowed, and is considered as fixed for the purposes of sowing. Instead, it moves using the Orthodox Chess King's move, only within its own Field. This counts as a sowing move as well. Since he is not sowed, the King does not need stack control to move. There is no castling. Like any other piece, the King cannot move into a full stack; if the other square in its King's field has a full stack, the King cannot move at all. This stack was sowed in the order: Knight, then Pawn. The King remains fixed. The Pawn which starts on the second row of the player's attacking line may double-move if, and only if, no other stack has been yet sowed on its mancala by its player (once you move anything on that mancala, the double move is no longer an option). The double-move is considered to be a single sowing move. The top row here is the last row for White. The stack is sown in the order Rook, Queen, Pawn and Bishop. The square with the Black King on it was skipped because it was already full. The Pawn is promoted to Man. The Black King is now in check from the Queen and the Man, and its other Field's square is threatened by the Queen and the Bishop. The only way for Black to get out of this situation is to capture the Queen and sow away the Man. Because the Pawn was not placed on the last row, it is not promoted. Capturing move: All Orthodox pieces capture as in Orthodox Chess, and the new pieces capture as described above. When capturing, the player must choose which of the opponent's pieces in a stack he captures, and his piece replaces it (apart from the advancer move of the Hammer, obviously). Only one piece can be captured at a time. The Queen captures the Black Rook (capturing move), then the Pawn is sown (sowing move). The Queen's stack is now under the control of both players. So far only individual moves have been discussed. Of course, the two moves you play within your turn are not always independent. The second move can depend on the first in many ways. In this section I want to broach on the two most direct and simplest ones, which for the sake of labels I will call capture-withdraw and capture-throw. In this diagram, the right side is the attacking line. The Queen captures a Pawn on White's retreating line, then White sows the Queen's stack, effectively making it retreat, so it cannot be captured by the other Pawn. Again, the right side is the attacking line. The Queen captures the Rook, then the resulting stack is sown in the order Queen, then Pawn. The Queen is not only safe but has thrown an opponent's piece away from the action. Remember that these combinations require you to spend a whole turn on them, so don't use them unless you can't find a more efficient use for your moves. There are two things to note about these diagrams. The Bomb's reach is variable, depending on how many pieces are in its stack, so it is somewhat overrepresented here. The Knight has only one good square, but it is the only piece which can reliably block a King's field square from the sixth row, so its attack value is much, much greater than it looks, perhaps equivalent to the Queen's. Somr remarks on the issue of back stacks as they influence checkmates. The position on the left is near-impossible to checkmate, unless you are able to pile up pieces faster than the opponent can capture. The stacks being full means that the Bomb is relatively useless (except to threaten the other King's field square), the King being on White's attacking line means the Knight is equally uselss, and Mans are also of relative uselessness unless you pile them on on both a8 and a7 (assuming this is the left mancala). So it seems this position is ironclad. There are, however, three problems with it. The first is that the Queen may capture one of the pawns and provide check from that position. The second is that adopting it requires one to forego any chance of checkmating on that mancala, unless you can attack with only a Knight, a Bishop and a Pawn without having any of them captured, which seems rather unlikely. Sowing the pawns on b7 but not sowing b8, on the other hand, is the very worse defensive scenario (see position on the right), worse than having an empty back row. Not only is the King exposed to most attacks, but it cannot be moved without spending two turns. Checkmate can be achieved easily with only three pieces, unless they are all pawns. Checks and checkmates are as in Orthodox Chess. A player wins the game when he has checkmated at least one of his opponent's Kings. In practice, it can be extremely difficult to figure out whether checkmate has been achieved, so the opponent has an extra turn to try to get out of check first. Furthermore, a player under multiple checks may make two sowings, or two captures, instead of the standard move order (a player under only one check, however, must follow the standard move order). It is possible for simultaneous checkmates to happen (by sowing pieces that simultaneously checkmate the opponent and lead to one's own checkmate, for instance, or by checkmating the opponent on one's extra turn). In these cases, the game is declared a draw. Victory by attrition is accomplished when your opponent has lost 12 pieces or more at the end of your turn. Again, an extra turn is given to the opponent. If the opponent captures on his extra turn so that you have now lost 12 pieces or more, the game is declared a draw. As in Chess, one may also resign on one's turn. Alternate "no draws" rule: I like the possibility of draws in this game as adding a further twist to the endgame, but I know many variant players do not like draws. Although I don't recommend it, one can simply declare the first person to checkmate or win by attrition to be the winner, and forbid a player any move which puts themselves in check or checkmate. This 'user submitted' page is a collaboration between the posting user and the Chess Variant Pages. Registered contributors to the Chess Variant Pages have the ability to post their own works, subject to review and editing by the Chess Variant Pages Editorial Staff. Click on the above link to view logs of Chesscala played on Game Courier.